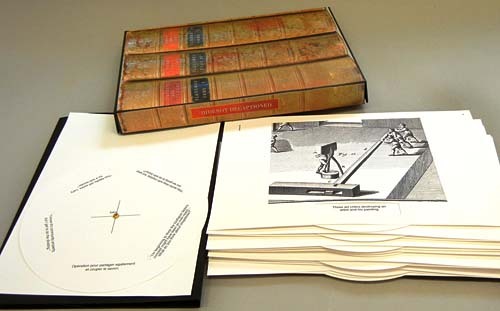 A vovelle is a paper disk attached behind a cover page so that the disk can be rotated to reveal alternative pieces of information on the cover page. Each vovelle shows a high resolution digital print of an engraving from the Encyclopédie chosen because of its puzzling and curious quality to our 21st century eyes. The engravings are visually arresting. They were meticulously drawn to show the processes that were being described. They also have a very human touch, showing everyday scenes and settings as background and context for the information. From our vantage point today--more than 300 years after its publication--many of the illustrations can be puzzling. They pique our curiosity. Each of the vovelles here carries an image from the EncyclopŽdie. 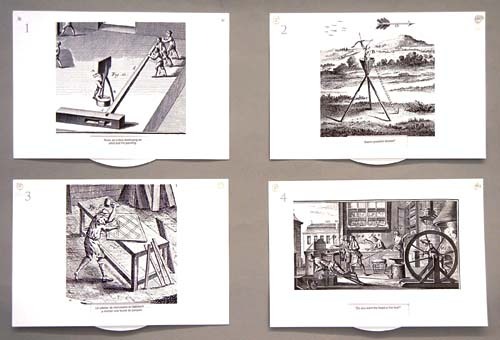 Initially, the vovelle displays the caption originally used in the EncyclopŽdie--in the French of the 18th century. Rotating the wheel of the vovelle gives alternative captions. 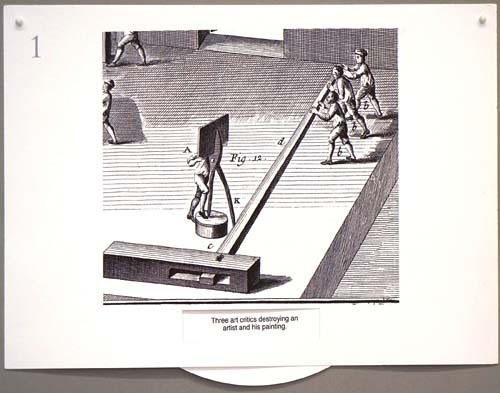 The disk of the vovelle can be rotated to show five different captions for the image including the original 18th century French along with four other captions which use humor and contemporary culture to offer an alternative to the original meaning. For example, the above vovelle has the following alternative captions. 1. Usines oú l'on travaille le cuivre. 2. "Wait!" I said, "No skin off my nose!" 3. "Why don't we try WD-40?" 4. "I'm really sick of facebook." 5. Three art critics destroying an artist and his painting. See the last line of this Section for the translation of No. 1. Each vovelle has pinholes in the upper corner, an invitation to mount several together on a wall with pushpins allowing an audience to interact with them, a design inspired by the title of the CBAA exhibition focusing on presentation and installation. Translation of Image 1 above. "Factory for the working, clipping and shearing of copper."